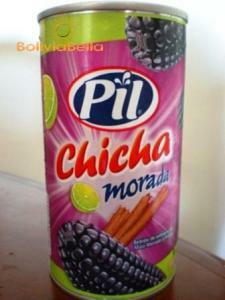 Chicha Morada. Bolivian Food and Recipes. Beverages and Drinks. Chicha morada is a non-alcoholic drink. It is incredibly refreshing and REALLY easy to make. Don't let the thought of drinking purple corn turn you off to trying this recipe. It's actually delicious and you're not going to eat the corn anyway! Chicha has been a staple in Bolivian food for thousands of years. The Incas made and drank this beverage throughout the entire Andean region (Ecuador, Peru, Bolivia, and northern Chile) before the Spanish ever discovered the Americas. It's still a tradition in the western Andean region of Bolivia. Unlike other corn drinks, this beverage is not fermented. It is also known to help you digest, and it's believed to help control weight, blood pressure and cholesterol too! Try this Bolivian recipe for chicha morada - easy to make at home, delicious on a hot summer day, and full of anti-oxidants to boot. And if you're visiting BoliviaBella's food page because you're supposed to cook something Bolivian for a school project, NO ONE is going have anything as unique as this and it's perfectly healthy for kids and adults. Just don't wait until the last minute - because you'll need to buy purple corn (I'll tell you where below). In Bolivia we get to buy chicha morada at the grocery store in a can, like soda but most people prefer to make it fresh and enjoy the delicious purple goodness! Check out my recipe for api morado which is also made from purple corn! In a pot, place the 4 ears of corn, cinnamon and cloves to cook. Cover them with water until the corn is completely covered with the 1/2 gallon of water. When the water begins to boil, uncover the pot and allow the corn to cook at a boil for 10-15 minutes. Strain the juice into a pitcher to separate the juice from the corn. Do not throw away the water/juice - it's what you're going to drink! Add sugar and lemon juice and stir until the sugar dissolves (you can substitute the lemon for lime if you want a slightly less acidic taste - I prefer limes to lemons myself, but you'll need about 4-5 to get the same amount of juice as the lemons because limes are dryer inside). Wait until the boiled juice is cool, then add the diced apples or pears and put it into the refrigerator to get cold (do NOT put the hot chicha in the fridge). The apples or pears (your choice) will float on top and will turn a dark red or purple as they absorb the color of the chicha. At this point, instead of adding fruit, in Bolivia people sometimes strip the purple corn kernels from the cob with a knife and add the kernels to the juice. If you choose to do this, you're actually not going to eat the corn. You leave it in the bottom of the glass and drink only the liquid. By leaving the kernels in the juice, it turns darker and the flavor is stronger. The juice also gets a little thicker after a while - maybe because corn is a starch. I like to strain it and drink just the juice. Important: The corn kernels will eventually ferment so if you do add the kernels, you must drink the chicha within 1-2 days. Fermented chicha is a different recipe - people add alcohol to it and let it ferment before they drink it. It loses all its healthy qualities once you do that. Looks sort of like grape juice, doesn't it? Drink this as cold as possible - it's delicious. Or add ice if you like. If you thought iced tea was refreshing, try chicha morada! (Morado means purple in Spanish.) La Tienda is an online Spanish and Latin American food store where you can buy purple corn really fast! They're located in Williamsburg, Virginia but they ship all over the world! They also have warehouses in Spain. Their website initially contained only food from Spain (a country they love!) but they've added a new section to their site called "New World Flavors" where they are now featuring all kinds of cool foods and ingredients from South America too (and they told me they're planning to add more very soon)! To purchase purple corn, click on this image and it'll take you to their site to make your purchase. The price includes about 4 ears of purple corn.